Tea is the second most widely consumed after water. The Chinese say better live three days without food than live a day without tea. Tea classified into several types such as white tea, black tea, and green tea. This plant was originally cultivated mainly in China and Japan. Over the years, the tea plant spread almost all over the world, especially in tropical and subtropical regions. The question is, how good tea for our health? Apart from the differences in color, there are many differences between black and green tea. Both types of tea is also processed in different methods. Green tea can be obtained through two methods. According to the traditional Japanese method, green tea is obtained by steaming the tea leaves. While the Chinese green tea prepared by frying in a pan without oil. To avoid oxidation, the tea is processed in no more than two days after being picked. The tea leaves retain green color so called green tea. Because in the process of tea leaves exposed to steam (heat) the fermentation can be avoided. Green tea works as an appetite suppressant, so widely consumed by people who are undergoing a diet program. Green tea can also increase your metabolism and immune system. This will increase the chances to fight the disease, and to help success the diet. Green tea can be used against several types of cancer. Green tea is known to stop the growth of cancer cells and help the body build up protection. Research shows that green tea may have a significant effect against gastric cancer, breast cancer, pancreatic cancer, lung cancer, prostate cancer, and skin cancer. Green tea can lower cholesterol levels in the body. Cholesterol can form plaque that can clog arteries. Cholesterol levels are low, meaning heart also will be healthier. Green tea could be the best beverage to fight cavities. It is known that green tea can be used to fight the bacteria that cause cavities. Benefits of green tea not only when taken alone, but is also beneficial when used for gargling. Unlike green tea, black tea, obtained after tea leaves oxidize before being dried. After the oxidation process is complete, the tea leaves are heated and then sorted according to quality. The black color of the leaves arise from the oxidation process. 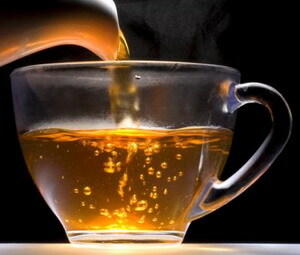 Both green tea and black tea can be used for treatment of various diseases. The difference in the amount of caffeine is a key differentiating factor between green tea and black tea. Black tea contains more caffeine than green tea, but with a lower level of coffee. Black tea is very good for protecting against heart disease and cancer. People with low blood pressure should drink black tea is also good for digestive problems. Women who want to lose weight is recommended to drink this tea. Both green tea and black tea is rich in vitamins and minerals. Vitamins are found in tea is vitamin C. Also, by drinking 2-3 cups of tea every day, your body will get a significant intake of vitamins B1, B2, B6, folic acid, and so on. Those with high blood pressure should avoid black tea. Black tea contains caffeine that can aggravate high blood pressure. Caffeine is also not good for people who have problems with calcium absorption.